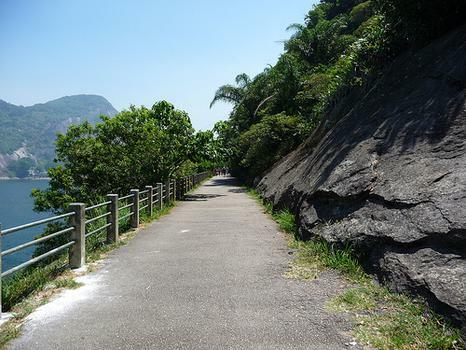 The Pista Claudio Coutinho is a 2km paved trail in the midst of lush greenery along the Morro Do Urca that offers breathtaking views of the Praia Vermelha (Red Beach). The Pista Claudio Coutinho is a 2km paved trail in the midst of lush greenery along the Morro Do Urca that offers breathtaking views of the Praia Vermelha (Red Beach). The trail entrance is 200 meters from the Sugarloaf ticket office, and the entire path can be covered in approximately half an hour.